Beware of generic T1 patch cables made with inexpensive Cat5 unshielded patch cable! 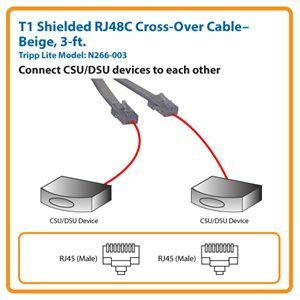 This three-foot Tripp Lite T1 Shielded RJ48C Cross-Over Cable is made from premium Quabbin 9720 T1-certified cable. It meets or exceeds all ANSI T1.403 (Carrier-to-Customer Installation – DS1 Metallic Interface) standards. Use the N266-003 to connect CSU/DSU devices to each other. The connectors have RJ48C wiring to transmit signals over the long distances required in T1 networks. Made from premium Quabbin 9720 T1-certified cable, the N266-003 has two balanced pairs with 22 AWG solid tinned-copper STP construction. It has a 100 ohm impedance level and a loss budget of 5.5 decibels. The N266-003 has a PVC jacket and gold-plated RJ45 (male) connectors that are wired to the RJ48C T1 cross-over specification for an accurate signal transfer. The N266-003 is compliant with the Federal Trade Agreements Act (TAA) for GSA Schedule purchases. For peace of mind, the N266-003 comes backed by a lifetime warranty. It’s manufactured in compliance with strict RoHS specifications, reflecting Tripp Lite’s commitment to environmental responsibility.